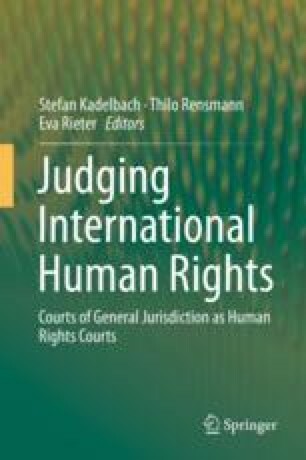 This chapter discusses the state obligations “to respect and ensure” the rights set forth in the American Convention on Human Rights, requiring a State Party to prevent, investigate, and punish, de officio, violations of the Convention’s rights. It deals with the so-called “control of conventionality” doctrine developed by the Inter-American Court, beginning with its judgment in the Barrios Altos case in 2001. In this case, the Court declared amnesty laws incompatible with a state’s obligations under the American Convention since such laws were an obstacle to the investigations and prosecutions required by the Convention. It determined that the mere existence of a norm that contradicted the obligations set forth in the Convention constituted a violation. Its interpretation of Article 2 of the Convention, which requires a state to give domestic effect to the rights set forth, evolved into what is now known as the “control of conventionality” doctrine. Under this doctrine, states are required, by means of diffuse control exercised by the judicial system, to determine whether their domestic legal provisions conform to the Convention. They must repeal or render without effect any laws that violate the Convention, and they must consider whether their interpretation of domestic laws is in accord with the interpretation made thereof by the Inter-American Court. This applies not just to the Court’s jurisprudence in cases to which the states are parties but in general to the jurisprudence of the Inter-American Court in all cases. Understanding this doctrine is important for the study of the domestic implementation of human rights decisions in the Americas.